Ludivine Sagnier was born on July 3, 1979 in La Celle-Saint-Cloud, France. She began taking acting lessons at an early age and made her film debut in I Want to Go Home when she was 10. 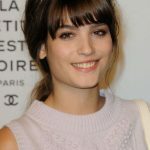 She has since starred in other French films including Cyrano de Bergerac, Children of the Century, Water Drops on Burning Rocks and Ma Femme est une actrice. In 2002, she starred as Catherine in 8 Women, for which she gained acclaim receiving a César Award nomination for Most Promising Actress. The following year, she gained wider fame after being cast in the French-British feature Swimming Pool.